Following the Seychelles Sports Fishing Club (SSFC) Marlin Slam Fishing Tournament two weeks ago which was won by Team Island Star with a 212-kilo blue marlin, this last weekend brought some more excitement to the scales. 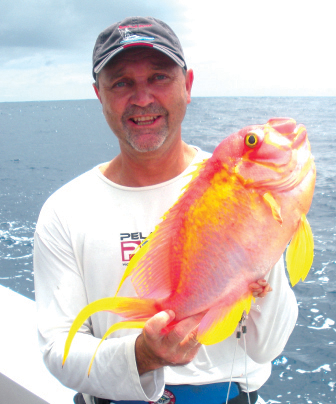 This time around, the Seychelles Fishing Authority (SFA) had to be consulted as avid angler Marc Houareau caught an unidentified species while bottom fishing off Mahe’s Southern bank. “We were catching some Job Jaune (Kalkal) and Saumon at a depth of around 100 metres when this beautiful fish came up on my line” Mr. Houareau told our TODAY reporter. “None of the team on board had ever seen such a fish and while we tried to revive and release it, the fish remained on the surface so we decided to bring it back to Mahe for identification purposes”, he added. The fish was taken to SFA and Rodney Govinden and the SFA laboratory personnel identified it as a “Gorgeous Swallowtail”, or “Meganthias Natalensis” in Latin. SFA has confirmed that they had seen only one previously in 2006 and that it was a very rare fish species indeed. Records of the anthiine fish genus Meganthias are rare and most species are only known from few specimens. In February 2012 one was caught in 150 metres depth about 10 nautical miles off Watamu Kenya and it was the first record of the species caught from Kenyan waters. Meanwhile, an 80.5 kilogram Yellowfin Tuna was caught last Sunday by Bruno Comoglio and Tarak Patel while fishing on boat BIG GUY. “The fish took the Black Bart lure at around 9am and sunk into the depths like a torpedo”, Mr. Patel said. “It dragged our boat for 12 miles during the fight and it took some 3 plus hours for us to finally bring it to the gaff. It was a serious battle between men and fish”, he added. 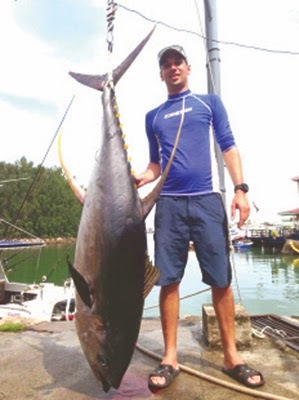 (IGFA) certified scale at the Marine Charter Association and it is the heaviest recorded yellowfin tuna taken on rod and reel in Seychelles. The fish was sold to La Plage Restaurant for SR 15,000 and the fishing team is donating the proceeds to a local charity organization. 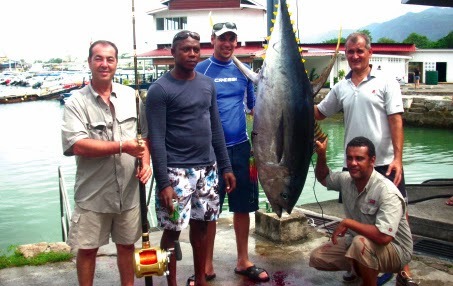 Large yellowfin tunas such as this one was once in abundance in the Seychelles waters and one only had to venture to the Fond Requin bank between Beau Vallon and Silhouette Island or the Malgaches Bank behind Therese Island to catch such trophy tunas. Sadly, the influx of commercial boats fishing in the Indian Ocean has greatly reduced the pelagic fish stocks and as these bigger and faster vessels continue to plunder our seas, such large tunas will continue to remain a rare sight at our docks. Well done to all the anglers!